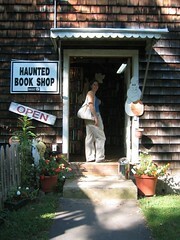 Discovering Niantic Book Barn was like stumbling across a diamond on the beach. We had read about the endless buildings and menagerie of nooks and crannies holding used books on everything imaginable, but seeing is completely different than reading. The Book Barn is easy to drive past and never give a second thought to. It's a giant barn alongside the road. In fact, we drove right by it on our first pass. 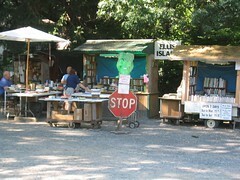 But pulling into the parking lot, you start to get the flavor of the place, with stands set-up to collect your books much like the lemonade stand you had as a kid. Books are piled on tables with rolling wheels and set up under tents that look like they will blow down with the lightest wind. But there they are books: upon books upon books on every subject imaginable. Roadchix journeyed in and found their home away from home, “The Underworld.” Not the least bit intimidated by the sign “The Underworld – Hot in the summer, Cold in the Winter, when it rains the river Styx runs through it and the paperbacks are not in alphabetical order. Welcome to Hades.” And thus, we were in the travel section. Twelve Curiosities books later and our bags many pounds heavier., we wound through the barns, outhouse (not in use as a toilet anymore! ), buildings and sheds filled with books. The clerk told us that people travel from all over the world to buy books here. It began in the basement of the original barn, which was owned by an Antiques dealer and grew into the gigantic mega-bookstore that it is now. This place is every bibliophile's dream.